Lounge, Kitchen dining, 3 bedrooms and a family bathroom with shower over bath. 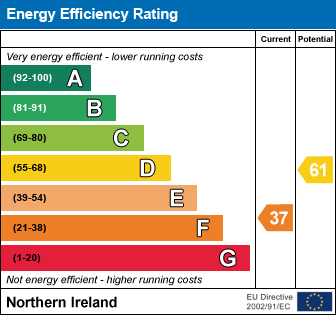 Further benefits include oil fired central heating and pvc double glazed windows and doors. To the front, side and rear there are laid in lawns along with a garden shed located at the rear of the property. Please note: The successful applicant will be asked to supply: Photographic ID, job reference, landlords reference, utility bill. A Credit search will also be carried out at a cost of £30 per tenant / £50 per joint application - payable by the tenant. Check out the property I found on PropertyPal.com: Ardbeg Drive, Coleraine BT51 3EQ.